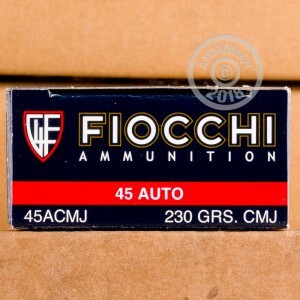 This Fiocchi .45 ACP ammunition is an excellent choice for general target shooting. 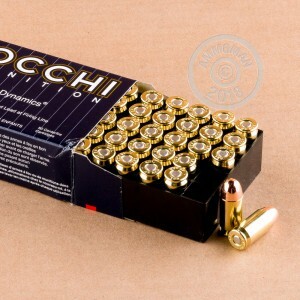 Each cartridge in this box of 50 fires a 230 grain complete metal jacket bullet at a muzzle velocity of 860 feet per second. This is a standard pressure load that will work well in compact carry pistols or older firearms not rated for +P loads. Complete metal jackets are ideal for indoor shooting as they provide full encapsulation of the lead core and help prevent toxic metal exposure. These cartridges use non-corrosive Boxer primers and reloadable brass cases. Grab a few or any other items totaling $99 or more to get free shipping from AmmoMan.com!